Latest post Sat, Mar 2 2019 8:00 PM by Igor. 8 replies. I get this message when I start my editor after upgrading to 2018.10. This has made the editor almost impossible to use. 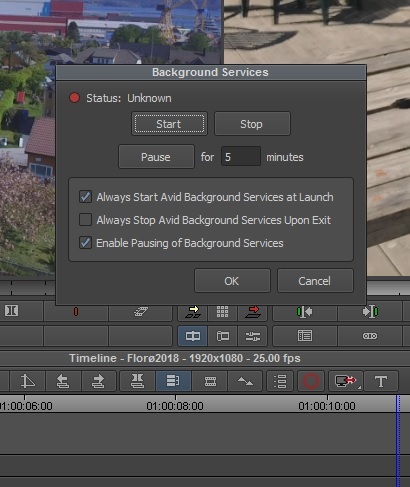 When I open the background services tab, I get this message. I really hope somone can help me with this issue. It seems that there are lots of problems with the Background Service and Dynamic Media Folders recently. Mine got solved by installing 2018.10. Hopefully Avid recognize this and will fix it soon! First, look at the console log (Tools->Console) and see if there are any error messages which might indicate the nature of the problem. If none, (and even if there are), you can try to manually start the transcode service outside of Media Composer. To do this, (assuming you're on Windows 10), right-click on the Windows icon (lower left of your screen) and choose Computer Management. Expand Services and Applications in the left-most pane and click on Services (or double-click on Services and Applications in the middle pane, and then click on Services). Scroll down till you find the service Avid Editor Transcode. This is the background provider. If it's not listed as Running, then right-click on it and choose Start. If it starts, then you should be all set. If it doesn't, it may provide an error message. If it won't start and you don't get a message, go back to the left pane and choose Event viewer. Expand the entry for Windows Logs. Look at both Application and System at the recent log entries (it's more likely to be under System if it's a service failure). 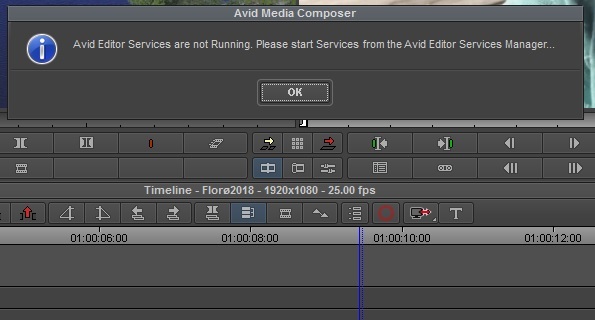 If the Avid Editor Transcode service is running and you still get the message, then it's a communication issue between the service and the appplication. Thank you for a quick response. I checked, and there were no error messages in the console log. The Avid editor transcode service was also running. It seems its the last option. A communication issue between the application and the service. Is there any way to fix this? It seems its the last option. A communication issue between the application and the service. Is there any way to fix this? I also am interested in knowing a solution for this. Does the account you're running under have admin privileges? If not, try running MC from an account that does. Tracking down why you can't communicate with the back end service is not something that you can do yourself. If it were me, I'd be tempted to do a complete uninstall of MC, clear out all the directries (except for the plugins), delete the old user profiles, make sure the services are completely removed, and then do a re-install. An entry appears in the background queue as if the page is unavailable. Background transcoder service fails to force start.